Pamlico Sound is big place, and much too large for one person to cover adequately looking for sharks. Fortunately, the North Carolina Division of Marine Fisheries (NCDMF), the state agency responsible for monitoring and managing saltwater fisheries, conducts extensive sampling within the estuary to keep tabs on the biology and ecology of the species targeted by North Carolina fishermen. They identify and measure everything they can, and this includes a large number of sharks. For our purposes, we used catch and environmental data collected by the NCDMF gillnet and longline surveys, which account for a lot of the shark data collected by the agency and between them cover the entire perimeter of Pamlico Sound. 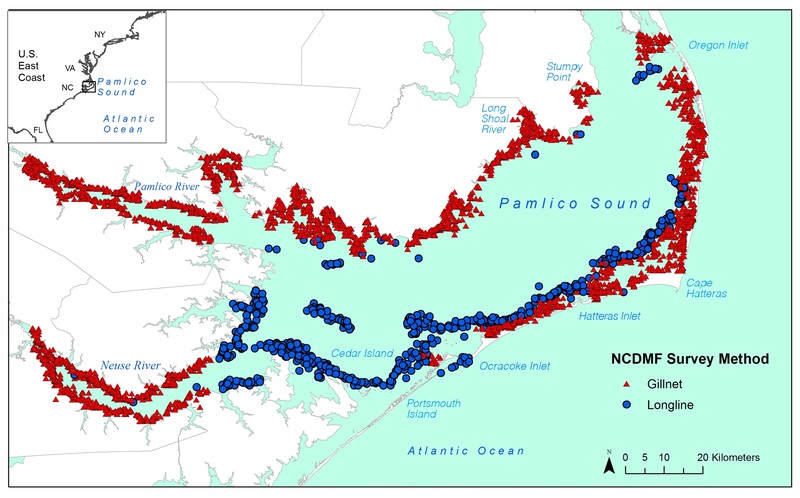 NCDMF gillnet and longline survey sampling locations from 2007-2014 within Pamlico Sound. From Bangley and friends (2018). Between 2007 and 2014 there were 2048 sharks of 12 species captured in the Pamlico Sound surveys, six of which we identified as the principal species due to their consistent presence and abundance in survey catches. These were the Atlantic Sharpnose Shark, Blacktip Shark, Bull Shark, Sandbar Shark, Smooth Dogfish, and Spiny Dogfish. The next step was a whole lot of statistical modeling, which fortunately was mostly automated thanks to a slick R package (gbm.auto) developed by co-author Simon Dedman and his colleagues. We used boosted regression tree modeling to figure out the preferred environmental ranges for each of the six principal species, which we then used to generate maps that predicted the likelihood of encountering each species across the estuary. Regression trees work by identifying environmental “cut points” between high and low likelihood of a shark being present and branching from there. The trees include all the environmental factors recorded during the surveys (in our case depth, water temperature, salinity, dissolved oxygen, distance from the nearest inlet, and distance from the nearest seagrass bed) and the end result is the combination of environmental ranges in which you have the highest likelihood of finding a shark. For example, this type of analysis would tell you that a Blacktip Shark is more likely to be found in areas with temperatures between 20 and 30 °C and salinity greater than 20 parts per thousand. Because there can be a lot of variability each time you run an individual tree model, the “boosted” part comes from the stats software replicating the trees hundreds to thousands of times, getting a little better at it each time, until it comes up with the combination of environmental ranges with the least potential to give you a weird result. That was the math. Here come the sharks. 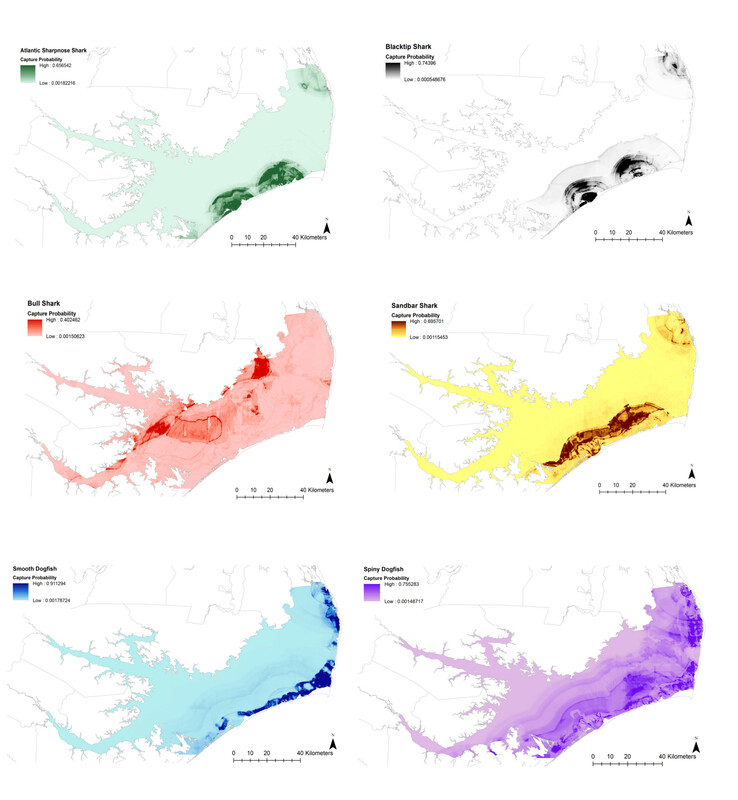 Maps of potential shark habitat for the six most commonly-encountered species in Pamlico Sound, based on their preferred environmental ranges. The darker the color, the higher the likelihood of finding a shark. From Bangley and friends (2018). The end result was the nice set of maps you see above. The distribution of potential shark habitat within Pamlico Sound tells us a lot about how each species is making use of the estuary. Four of the six species (Sharpnose, Blacktip, Sandbar, and Spiny Dogfish) showed a pattern I like to call “inlet hugging,” which is defined by a preference for higher salinities and closer proximities to the inlets. As you’d expect, these are primarily ocean-going sharks not known for traveling far into brackish water, so they’re likely ducking into the inlets to feed or seek temporary shelter but aren’t spending much time inside the estuary. These species do differ by season, with Spiny Dogfish occurring almost exclusively during winter, Sandbar Sharks occurring most often in the fall, and the Sharpnose and Blacktip Sharks sharing the summer (it’s worth noting that Blacktip Sharks occasionally eat Sharpnose Sharks). Things get more interesting with the Bull Shark, which has the ability to tolerate lower salinities and seems to prefer the western side of Pamlico Sound, but not necessarily up into the Neuse and Pamlico Rivers. This species also prefers warm water and occurs during the summer. You’ll be hearing more about what this species is doing in Pamlico Sound in the very near future. Finally, the Smooth Dogfish, which was by far the most common shark caught in the NCDMF surveys (by number this species account for over half the total number of sharks caught) preferred higher salinities and summer conditions but its potential habitat almost perfectly overlapped the seagrass beds hugging the inshore side of the Outer Banks. Smooth Dogfish primarily feed on crustaceans like shrimp and crabs and most of the individuals caught in NCDMF surveys were small juveniles. Pamlico Sound may represent a major nursery for this species, and it’s likely that young Smooth Dogfish spend a lot of time in those extensive seagrass beds feeding on the small crustaceans hiding in them. It’s neat to know where sharks might like to hang out, but there are some very practical uses of all these pretty maps. Spatial management, the practice of managing natural resources by area, is becoming increasingly important in the marine field not only for fisheries management, but coastal and offshore development. This is why this project has inspired or directly lead to further research on the sharks of North Carolina’s estuaries, including an already-published survey of Back and Core Sounds (supported by NC Sea Grant) and an ongoing survey of the lower Cape Fear River (supported by the NC Aquarium Society). This kind of information can identify areas of particular importance to a species so they can be properly considered when fishing, building an offshore wind farm, building some houses on the shore nearby, and even deciding how to manage runoff far upstream. Knowing which areas are actually important to a species is crucial when siting marine protected areas at both small and large scales. And all this speaks to the importance of good, basic biological survey information collected by agencies. If nothing else, it’s humbling to know that the rivers flowing through parts of North Carolina as far from the coast as Raleigh and Greenville connect the people there to a lagoon full of sharks. Nice blog on the paper, Chuck! You’re right, there have been some tag pings inside the sound from a few of the Great White and Tiger Sharks OCEARCH has been tracking. My understanding is that those tags can sometimes have a huge margin of error if the shark only surfaces briefly, but some were picked up so far up the sound that they were likely at least somewhere inside the estuary. I’m sure OCEARCH will be sorting that out as more of their research comes out. We looked at sharks documented in the NCDMF surveys, which haven’t picked up either of those species yet. Still a lot to be learned about sharks in Pamlico Sound. I believe it’s a little misleading from the other article that just came out stating that bull sharks are now just starting the use Pamlico Sound as a nursery or that they are coming in in increased abundance. 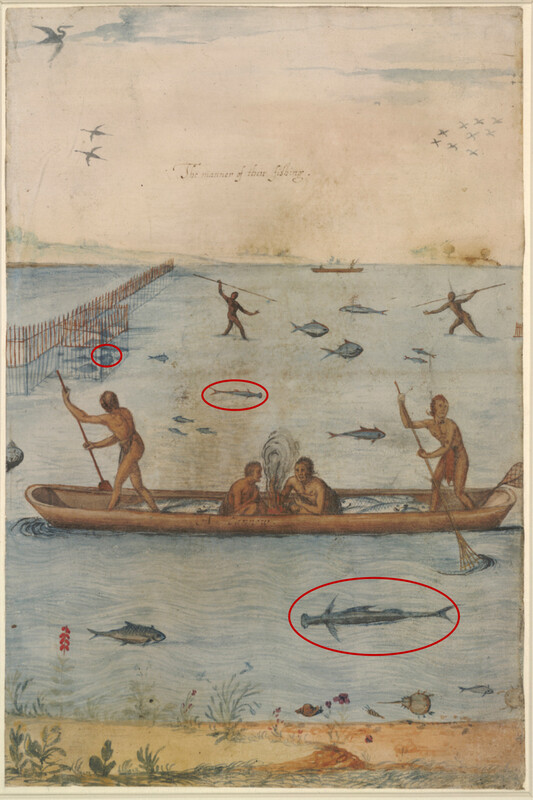 Being from Cedar Island and commercial fishing and working in fish houses as a youth and now having a Marine Bio degree I can say Bulls have been in our sounds and bays for a very long time as well as large Lemons. I believe sampling methods could reflect the lack of data compared to commercial fishing methods. Hi Jay. I agree that adult Bull Sharks have been in the sound on a regular basis for a long time. The abundance of small juveniles up in the western part of the sound is what seems to be a more recent occurrence. That said, the majority of the small Bulls have been caught in the NCDMF gillnet survey which has had less coverage down around Cedar Island and Core Sound, so I’d definitely be interested in hearing what you’ve been seeing down there.